Now I know I've said as much before, but this walk really is just a little bit different. It takes you past some truly outstanding architecture with a more industrial, utilitarian flavour: stuff that was conceived to be useful rather than just pretty; stuff that screams out our industrial past. It follows the tow path of the Grand Union Canal, which was once the major artery linking London with the rest of the canal system throughout the country. Barges loaded with coal, foodstuffs and manufactured goods once snaked their way down this watery corridor to feed the burgeoning demands of the Capital, jostling for position in the locks, overnighting in noisy clusters along its banks with their horses grazing on the grassy meadows that fell away to either side. It's a different picture today, but with a little bit of imagination you can just about see how it used to be: a bustling, busy waterway, full of the drama of everyday life. One of the biggest names in nineteenth century engineering is unquestionably that of Isambard Kingdom Brunel. 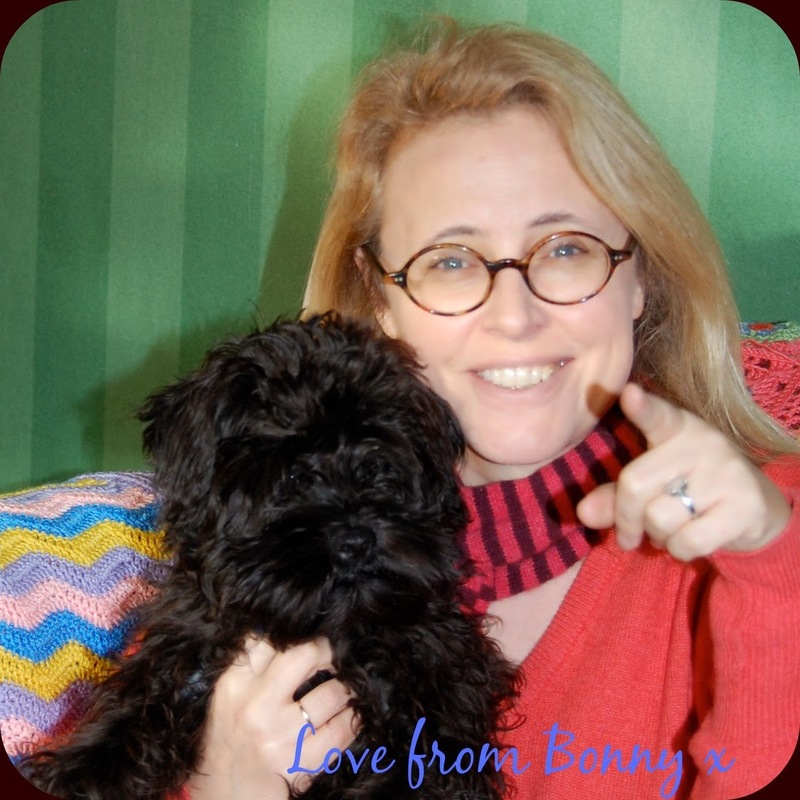 Did you know that the two projects, which bookend his career are to be found here in Ealing? 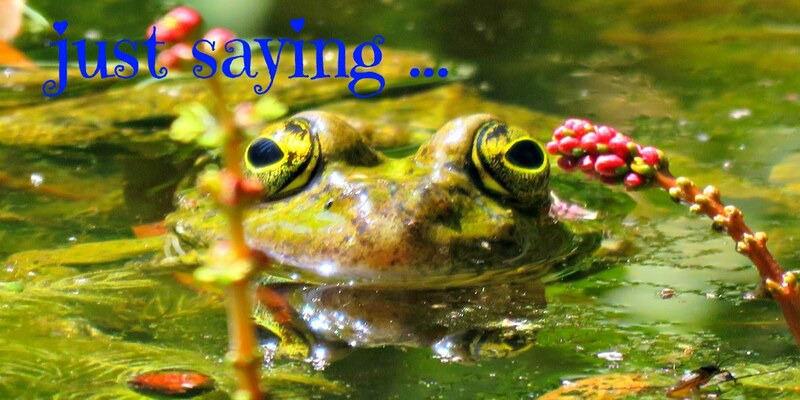 And that it's possible to take an afternoon stroll along the banks of the Grand Union Canal and the River Brent to see them both? The two projects that I'm talking about are the Wharncliffe Viaduct, built by Brunel at the beginning of his career (1836 to 1837), and his (slightly wacky) Three Bridges, where a canal crosses a railway, with a road running over the top, which was his last major project, completed just a couple of months before his death in 1859. The walk starts at the Three Bridges, which you can find on Windmill Lane, just behind Ealing Hospital. The post-code is UB2 4UT if you want to track it down on the SatNav. We parked in the retail park on Armstrong Way and crossed Windmill Lane to get down to the canal tow path. Alternatively the closest underground station is Boston Manor on the Piccadilly Line. 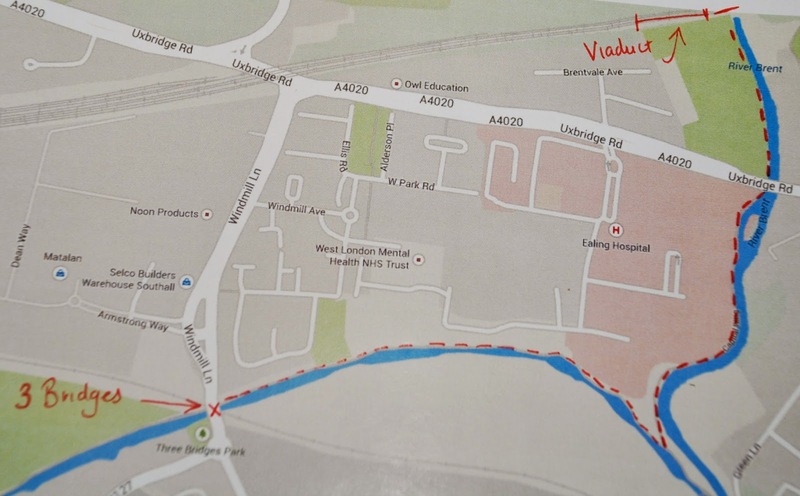 If you follow my broken red line on the map below it'll take you from the Three Bridges to the Wharncliffe Viaduct. Ah, the great Turner, I should mention that he came to live in Brentford with his maternal uncle, Joseph Mallard William Marshall in 1785/ 1786 for about a year. He was born in Covent Garden, but was sent out here to enjoy the cleaner air. It must have made an impression on him as he came back again in 1808 to paint the windmill. It's a pity about all the rubbish that's been dropped down onto the railway tracks, but you get the idea. Brunel channelled the canal across the railway line in a great big cast-iron trough, and then built a metal bridge on top to carry the traffic on Windmill Lane. Now look carefully. Do you see a black metal rod on the right hand side of the bridge just to the side of the tow path? 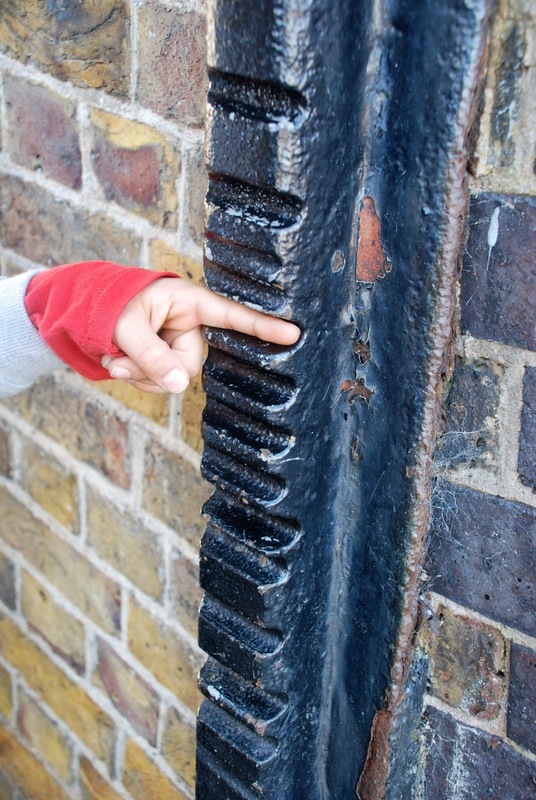 This iron bar was attached to the side of the bridge to protect it from rope burn. Back when the barges were being hauled along by horses - or, more recently, by tractors the ropes cut into the brickwork eroding the structure of the bridge. To protect it they put this bar on the wall, and the grooves that you can see were made by the friction and pressure of the ropes pulling the barges along. Impressive, eh? I'm feeling a little bit closer to the daily struggle of those long-forgotten draught horses and the folk who drove them already. 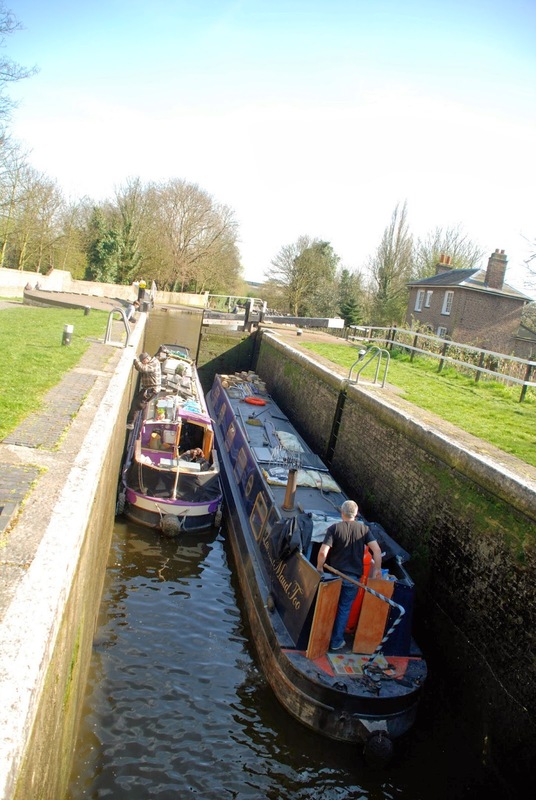 One of the many lovely things about this stretch of canal is that it's still working; it's still got boats, the locks still operate and there's enough traffic to make things interesting without making it so busy that it isn't peaceful to walk along. And then we strolled by the Lock Keeper's Cottage, although I doubt that there's a lock keeper in residence these days. The old Hanwell Lunatic Asylum is on the left as you walk away from the Three Bridges. You can make it out in the photo below. It was opened in 1831 to house pauper lunatics, and soon grew to become quite a busy little community. Behind those high walls were large kitchen gardens, a brewery, a chapel with its own graveyard, the asylum and accommodation for about a hundred workers. The site had been chosen for its relative isolation from other built up areas, coupled with the comparative ease with which it could be visited occasionally by the families of the poor souls incarcerated within. Many of the one hundred or so people who looked after the one thousand plus patients also lived within its walls. Their work was poorly paid, but it was attractive to have accommodation thrown in, even though it involved living in an asylum. Many of the staff came up from the West Country to work here, and would seldom have made it home to visit their own families. A blocked up arch used to allow coal deliveries to the asylum and for the surplus garden produce to be loaded onto barges for sale in the London markets. You can see it on the lower left of the photograph below with part of the old hospital building towering above. There are also a few fire holes in the wall along here that firemen would have been able to open to fetch water from the canal to put out any fires that broke out in the hospital. My boys were very interested in how the locks worked, and spent a happy half hour chatting with some boat people who were going through the Hanwell Lock system. 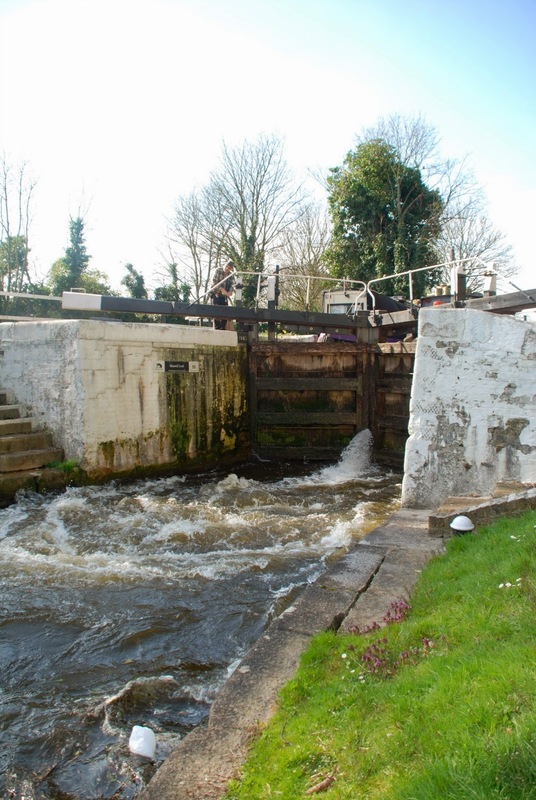 It has to be said that the canal falls like a flight of stairs along this stretch with multiple locks making for slow progress on the water. Meanwhile Maxi (our dog) had a good old bark at the canal boat dogs, safe in the knowledge that they couldn't get at him. He's a real lion when he knows he's safe. ... all the way to Hanwell Bridge. The pathway continues under the arches of the bridge, taking you underneath the Uxbridge Road and into Brent Meadow, a traditional hay meadow, on the other side. When the river is high the path may flood but you can take the steps up to the Uxbridge Road, and go across at street level. When you emerge on the other side you have a magnificent view of the Wharncliffe Viaduct, Brunel's first major project for the Great Western Railway Company, which, as you can see, has stood the test of time and is still in use today. 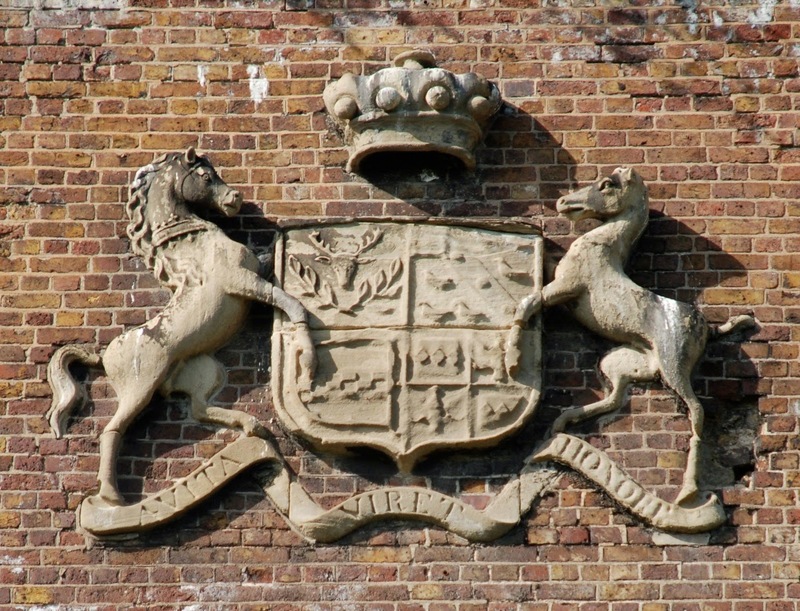 The coat of arms of Lord Wharncliffe, who was the chairman of the Great Western Railway Company when the bridge was built, adorn the central pillar of the viaduct. It's a pity about the graffiti, which also adorns the bridge, but it's only a minor detail on such a majestic structure. Not surprisingly it enjoys Grade I listing. 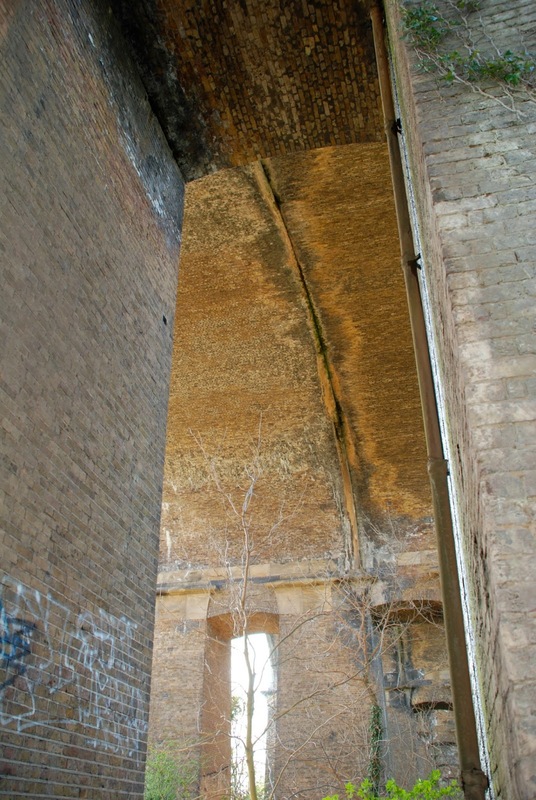 You can see a large, dark crack in the underside of the arches, which marks where the bridge was extended. Brunel originally built it to fit two broad gauge railway tracks, but then Stephenson's narrower gauge tracks were adopted as the norm. Traffic increased and they modified the infrastructure to accommodate the new standard so that everything was the same throughout the country. As a result they widened the bridge to take 4 narrow-gauge tracks across the valley. 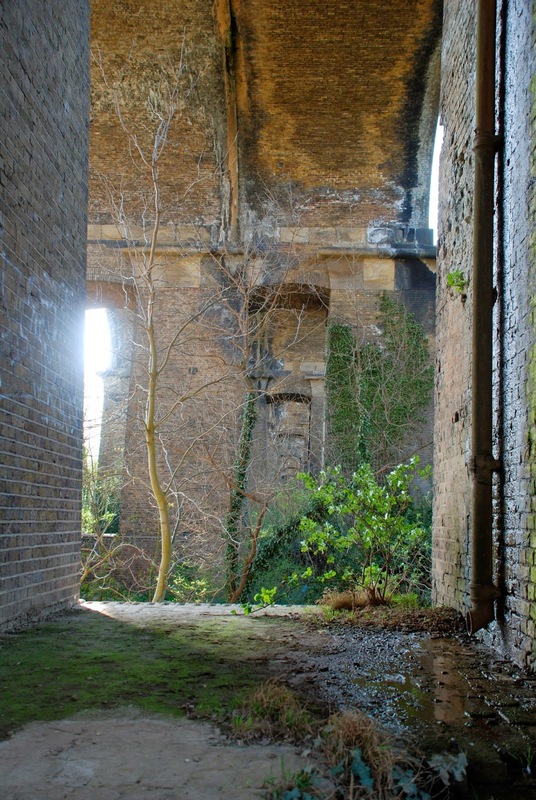 The brick pillars supporting the viaduct are hollow, creating perfect bat caves inside. I'm told that there are thriving colonies of happy bats living in the bridge, although they weren't around when we passed by. On the sides of the pillars I saw several window-like openings, which presumably allow them to come and go as they please. You can travel on over the footbridge on the right hand side of the viaduct and wander up the hill behind to Churchfields Recreation Ground. There's a children's play area and a lovely green park up there. On Church Road, on the other side of the park, you may like to take a look at the Hermitage, a lovely little gothic cottage built in 1809. I'm sorry but Emi couldn't be persuaded to leave the swings, and as a result we didn't make it that far to take a photo. But you can't miss it: it's a sweet, thatched building that looks like somewhere Bilbo Baggins would be proud to call home. Now the only slight snag is that this walk isn't circular, so you have to retrace your steps and go back the way you've come, but that's not a serious draw-back given how much there is to see. It's not a long walk. You can comfortably cover it, there and back, in an hour and a half without breaking a sweat. Beautiful pictures. :) I hate when people throw trash on the ground. They should take pride in where they live. Our house is on the corner of two streets, and I regularly fill grocery bags with cups, cans, bottles, and cigarette butts.